Hey there! If you saw my WIAW post yesterday you already know what's in store for you here. A super easy, filling and healthy pasta bowl! I was inspired by Julie's lunch the other day, and am so glad that I whipped this up. I've had it for dinner twice and lunch twice and I'm still not sick of it. This might be a new go-to for me when I don't want to do a bunch work and when I want leftovers for the week. I love this so much because it's packed with whole grains, protein, veggies and, of course, a little bit of cheese (only a bit, I promise!). It keeps you full for a long time, without making you feel stuffed or uncomfortable like most pasta dishes can. So, whip this up and enjoy a super filling meal! On a side note, you're welcome to use any kind of chicken sausage, but I absolutely fell in love with the smoked apple chardonnay chicken sausage from Trader Joe's. I immediately went out and bought some more the day after I made this. I highly recommend it! *To roast vegetables: Preheat oven to 400 degrees. Spread out on sheet pans or roasting pans. Drizzle with olive oil and season as you'd like (I used salt and pepper, plus garlic powder). Cook for 15-25 minutes. *Prepare pasta according to package directions. When you go to drain pasta, place spinach in the colander first. Pour the water over it, and allow the pasta water to wilt your spinach! *Slice chicken sausage into bite size medallions. Cook on a skillet with olive oil, until slightly browned on each side. 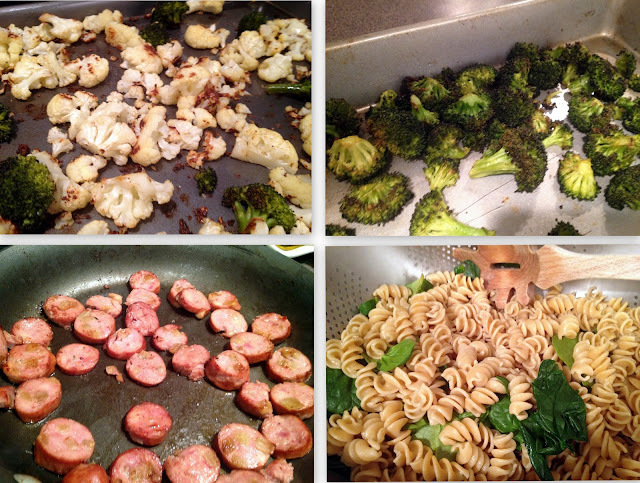 *In a large bowl, combine roasted vegetables, pasta, spinach and chicken sausage. Place individual servings in smaller bowls. Drizzle a little olive oil on top and sprinkle with 1-2 tbsp parmesan cheese. Serve hot! Forgive the fuzzy pictures...I was on the phone with my sister while snapping away from my phone! Ta-da! Still just as tasty looking as yesterday.